The defence structure of the Festung Hoek van Holland can be categorised into three lines of defence and a rest group. The coastal front consisted of the entire coast of island De Beer, as well as the coastline from Hoek van Holland up to the southern tip of the border of the municipality of Monster. 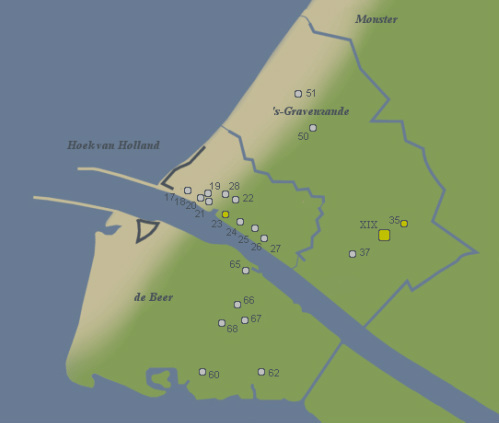 Holland had a range varying from 8 to 43 kilometres (5 to 26 miles). So theoretically it was possible to hit targets near the municipality of Monster. The coastal batteries could be used against naval targets, but even against land targets as well. The nearby anti-aircraft batteries were tasked with defending the airspace above Hoek van Holland. In addition to coastal and anti-aircraft batteries, there were also multiple Widerstandsnester (resistance nests) which could cover the entire beach with artillery and machine gun fire. Furthermore, a concrete wall (Panzermauer, or anti-tank wall) was erected at weaker points along the front, as a passive measure of defence. This wall ensured that enemy tanks could not easily break through into the interior of the country. Overview of Stützpunkte (Stp. )(support points) and Widerstandsnester (Wn. )(resistance nests) on the coastal front. English. This is the name of the extension of the river known as the Nieuwe Maas, or New Meusse, which flows through Rotterdam. The estuary at Hook van Holland is part of this extension. The eastern part of island De Beer was also part of the outer mainland front. As the name suggests, the outer mainland front was meant to defend against an attack from the interior of the country. Passive defences on this front consisted of an anti-tank ditch (Wasserpanzergraben) filled with water. Minefields were laid on both sides of the ditch. It could also be covered by artillery and machine gun fire from several Widerstandsnester along the ditch. There were only a select few roads granting access into the Festung Hoek van Holland. These roads interrupted the anti-tank ditch. So-called Höckerhindernisse (called dragon’s teeth in Dutch) were placed along the short stretches between the road and the ditch to link them up. Overview of Stützpunkte (Stp. )(support points) and Widerstandsnester (Wn. )(resistance nests) on the outer mainland front. The inner mainland front stretched along the innermost of the two anti-tank ditches. Of course, there was no inner mainland front before the secondary (outermost) anti-tank ditch was dug and the outer mainland front had been created surrounding it. 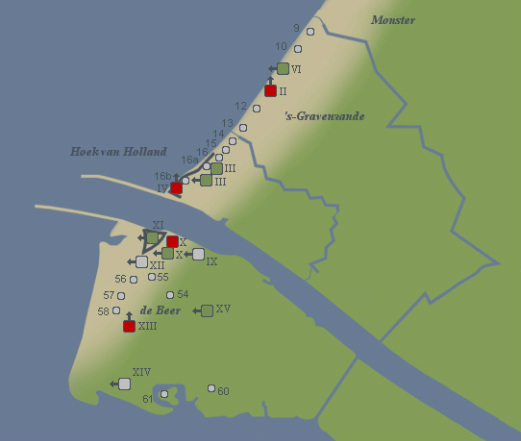 Like its counterpart, the inner mainland front also consisted of a ditch, minefields and Widerstandsnester, but uniquely it also had disposal of two artillery batteries from the Divisions-Artillerie (division artillery). Overview of Stützpunkte (Stp. )(support points) and Widerstandsnester (Wn. )(resistance nests) on the inner mainland front. 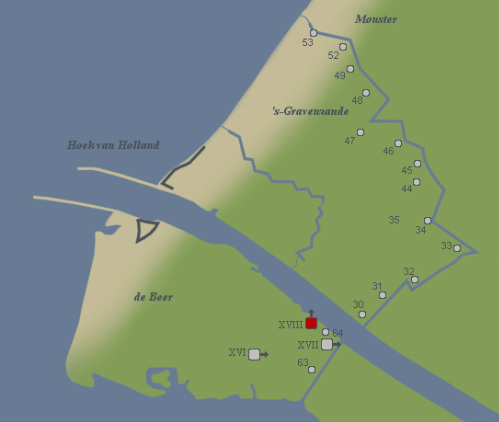 Apart from the aforementioned lines of defence, there were various other positions in the Festung Hoek van Holland: the Festungkommandant headquarter; the port zone (around the docks known as Berghaven) the village of Hoek van Holland itself, the village of ‘s-Gravenzande, as well as a battalion headquarter. There were also positions for search lights, light anti-air defences and there were various infantry positions. Overview of Widerstandsnester (Wn. )(resistance nests) in miscellaneous positions.